The new V847 Wah-Wah pedal is an enhanced version of the most famous guitar effects pedal of all time. 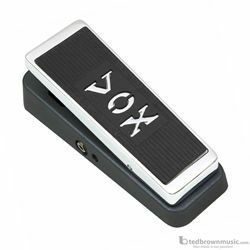 Based on the specifications of the original pedal developed by VOX in the '60s, the new Wah-Wah offers guitarists the same legendary tone with the addition of AC power capability and a buffered input jack for preserving the unprocessed guitar tone when the pedal is not engaged. The pedal’s inductor has undergone a redesign to be closer in specification to the original VOX wah inductors, for improved dynamics and tone. These additions will benefit players of all genres who use a wah pedal as an integral part of their sound.